I recently started an exciting, new position as Coach of the University of Illinois Collegiate Billiards Team. We are in the Midwest Conference of a new, ACUI (Association of College Unions) sanctioned, league called US Collegiate Billiards which is headed by Pro Player and famed Coach Mark Wilson. As part of this league, we travel to each other's campuses to play matches against the different teams. It is really awesome to have the opportunity to give back the game I love and work with the student athletes to build the sport at a college level! In prepping for our big inter-collegiate matches, we use a number of competitive scoring games to improve key skills while keeping practice fun and social. In this article, I'd like to share a few of those effective (and fun) practice games with you. The first game we play is called 15 Ball. It is a variation of another game commonly called equal offense. The game starts by racking up all fifteen balls in the triangle. The player then breaks the balls open. Any balls pocketed on the break gets spotted. 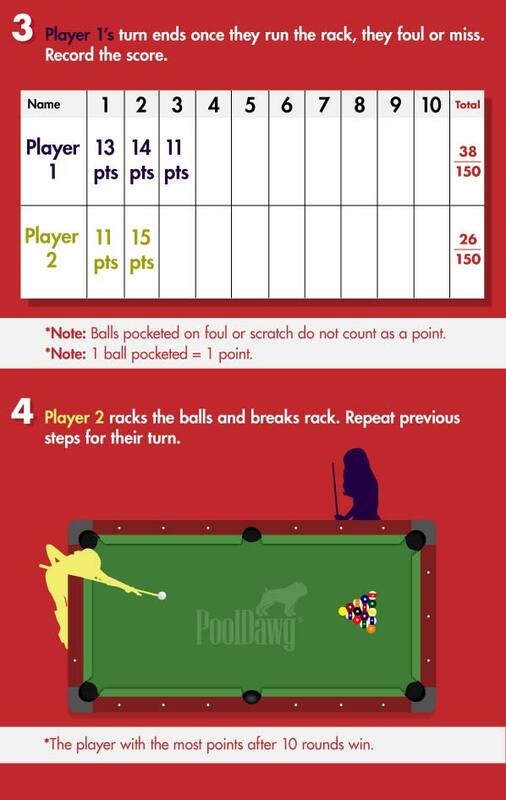 Fouls on the break (scratch, or cue ball leaving table is no penalty) the player then takes ball in hand anywhere and must shoot in as many balls as he/she can. You get one point per ball. You must call your ball and pocket. A miss or a foul results in your turn being over. Any balls pocketed on a foul do not count. Player two then racks the balls and repeats the process. You are playing yourself essentially. We usually play ten frames with a possible 150 points. The exercise teaches you how to pick out patterns, manage clusters and identify problem balls. This game sounds easy but believe me it is tougher than it sounds to score a perfect 150. Frank Says: "The Ultimate Pool Challenge Bundle has two, 52 card decks of card (original and advanced series) with different shots to practice. These games force you to practice shots you might not otherwise try so they are a great way to expand your shot repertoire!" 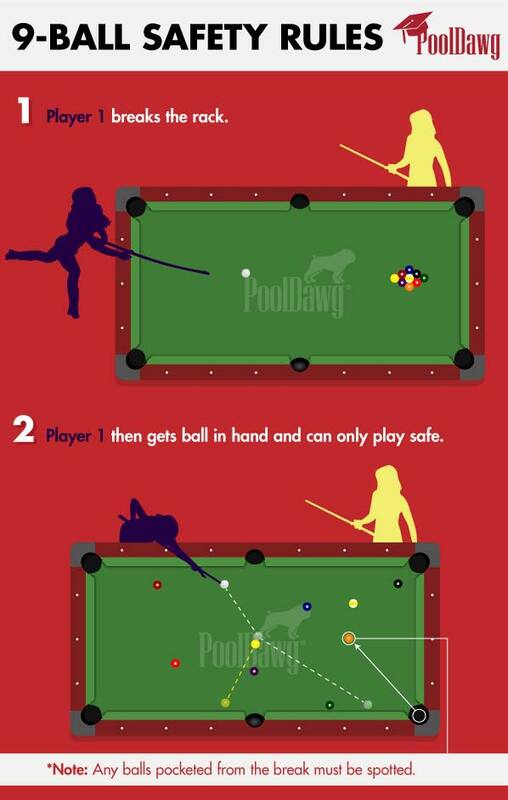 The next game we play is called the 9-Ball Safety Game. This is a great game to play with a friend to work on both your ability to identify good safety options and to work on your skills at getting out of a bind. 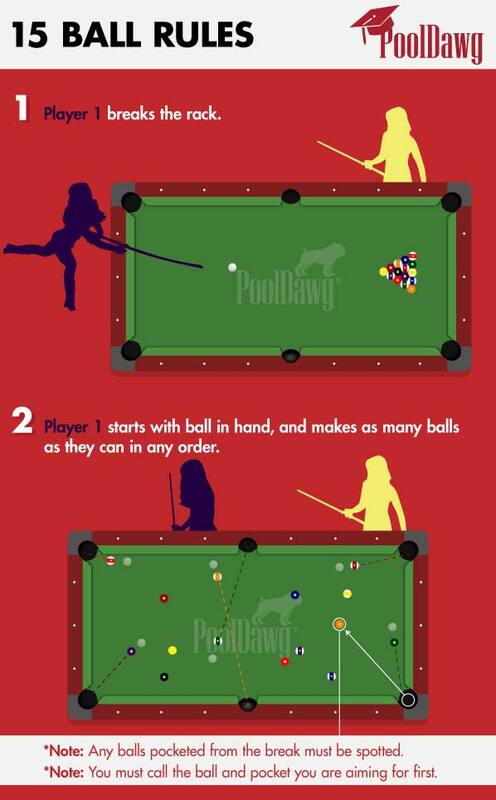 Rack up a game of 9-ball. Player 1 breaks the balls; any balls pocketed get spotted. Player 1 then gets ball in hand, he must always play safe. Player 2 then has to attempt to get a good hit. If Player 2 fails to get a hit, Player 1 gets one point. If Player 2 makes a good hit then Player 2 gets one point. If Player 2 gets a good hit and pockets the ball he/she gets two points. Player 1 then takes ball in hand again and continues the cycle of playing safe. The game is really fun to play and makes you think both offensively and defensively. We usually play to 10 points and then switch roles, this way both players get to play defense and offense. The final Drill I want to show you is really fun as well. 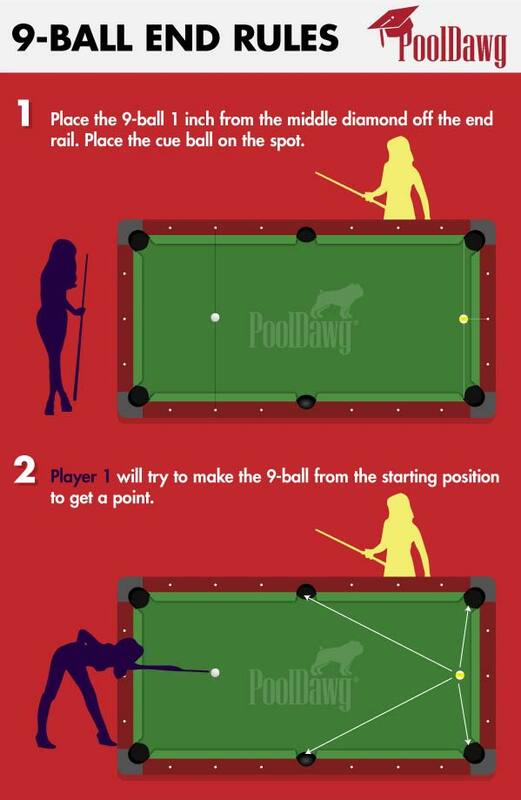 It is called 9-Ball End Game. Figure 3 shows the starting point for the balls. The cue ball is on the spot and the 9-ball is sitting about one inch off the end rail at the middle diamond. 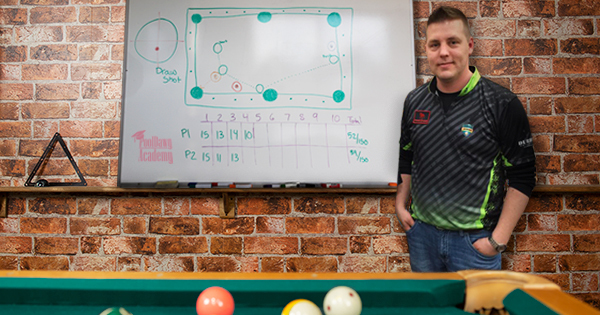 Both players have one goal: make the 9-ball. Player one starts from the starting position on the spot. 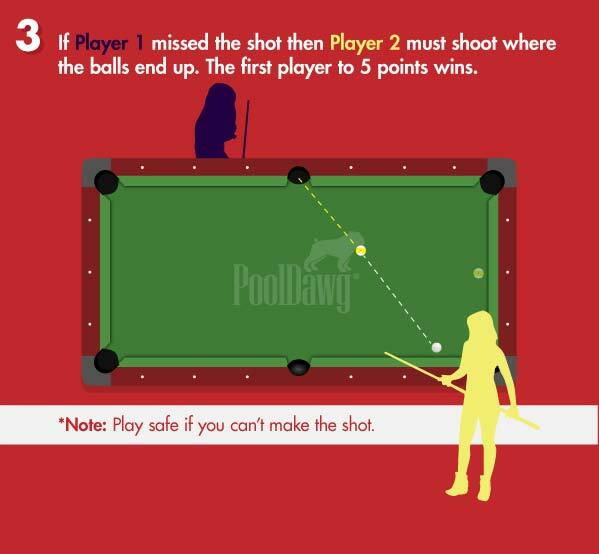 If Player 1 misses then Player 2 must shoot from where the balls end up. 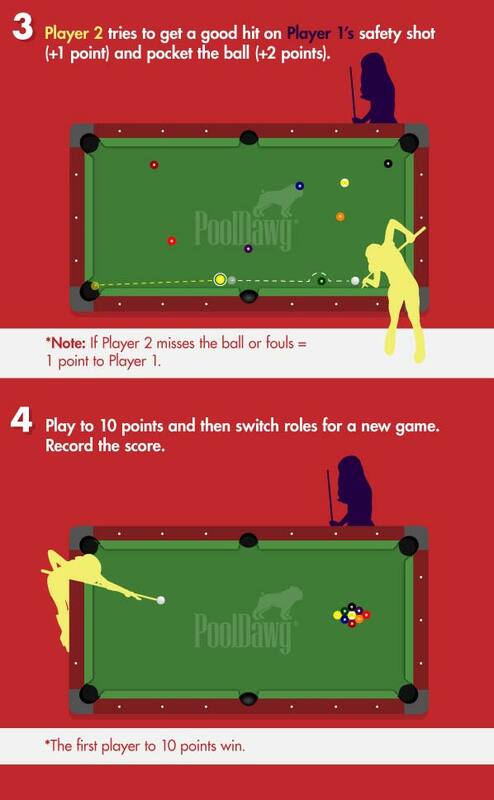 Once someone makes the 9-ball he/she is awarded one point. You then set up the opening shot and shift time, Player 2 starts (alternate the break so to speak) we usually play a race to five points. This drill not only gets you comfortable shooting tough shots on the game winning ball but it helps you to identify two shots (shots that are both offensive but if missed may leave your opponent safe). I hope this gives you a small insight on how we are training and hopefully these drill swill help improve your game as well.